Blend multiple normal photos into one, magic will happen: Collage result always spices up the whole impression, which makes collage creation a worthwhile thing. Many people suggest us using Photoshop to make a logo, edit a photo, or blend photos into one. It’s not a solution that works for everyone. For those who lack design experiences, it’s hard to make use of Photoshop very well and create a satisfying collage result. How to Create an Amazing Collage like a Professional Designer? In order to create a collage on your own, an easy and resourceful collage maker needs to be introduced, which will deliver much help in the process. We bring you with FotoJet Collage Maker for Windows, which is never just a simple, feature-limited collage software. It does rather better with the abilities to blend images. • 100+, easy to apply collage templates. Enough choices! • Fantastic yet practical text fonts and cliparts. • Support sharing to social media like Facebook / Twitter / Pinterest / Tumblr. FotoJet Collage Maker compiles multiple images into one. To those who are not good at blending photos or arranging spaces between pictures, navigating FotoJet Collage Maker is much easier. It defaults with various collage templates for you to choose from, to edit and to begin with. After selecting a template, you will choose the photos for the collage, fonts to add texts, clipart and background to spice up the collage. 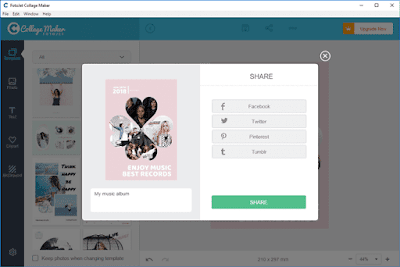 After a launch of FotoJet Collage Maker, the collage options are displayed in the interface. Each list is a portal to more focused templates under the category. So you can click one to view its templates, and hit [<] icon on the top to go to previous menu. With it, you can easily showcase the photos of a vacation or your favorite moments. 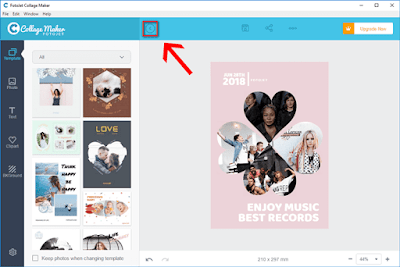 With FotoJet Collage Maker, you can not only blend multiple photos into a fantastic photo grid, but also create impressive photo cards, comics, fun collages and etc. By taking advantage of 1000+ grids & collage templates, thousands of searching resources and powerful editing tools, you will never be stuck for inspirations when creating unique masterpieces. When your collage is ready to go out and share with the public, this niche app offers a pic download option, a social share option and a save project option. To social media users, four choices - Facebook, Twitter, Pinterest and Tumblr – are embedded. 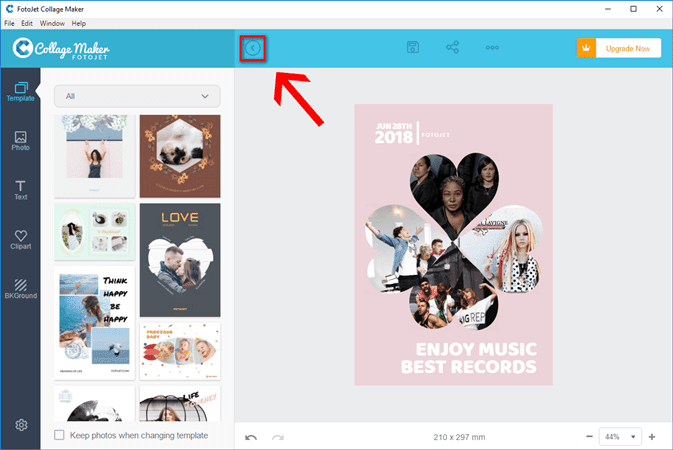 Let’s assume you don’t prefer installing software for Windows, then you may like the online collage app, which is a bit different from the Windows version that we’ve exampled here. FotoJet Collage Maker for Windows is a niche graphic software for everybody. For the majority of people, we just want to blend photos in the same theme and make a nice-looking collage for keeping. And Windows FotoJet Collage Maker happens to work on collage and turn it into a simple and delightful task.